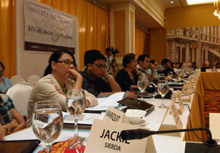 The annual summit of representatives from print, television, radio and even online media was held on September 30 to October 1, 2011 in Cebu City, Philippines to discuss how journalists could defend themselves from violence as they pursue truth in the world’s most dangerous place for journalists. Statistics show a total of 180 journalists killed, 121 in the line of duty since 1986. Print and radio journalists are the most vulnerable, and killings continue up to today. A number of factors were identified to contribute to violence against media: socio-political and economic realities, corruption, and culture. Participants in the summit talked about how deaths of journalists can be brought to the attention of the public, that media violence should be viewed as an affront to the freedom of expression. The issue of justice and governance was raised as media members call for the prosecution of perpetrators. Existing mechanisms to protect journalists from violence as well as to maintain the standards of their profession must be reviewed and reinforced. In turn, they agreed that they should maintain accountability in their work – truth and fairness must always be upheld. “Truth is always evasive. 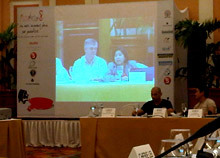 We have to be always alert in pursuing it,” reminded Former Isabela Governor Grace Padaca who was the keynote speaker. She recounted her experience as a radio broadcaster where she gained her popularity as “Bombo Grace.” She said that media should use its power prudently and it should not go down the level of “perarazzi” or journalists that are only after money. MediaNation is an annual event organized by pagbabago@pilipinas. It is an occasion where media members can discuss challenges in their field and share best practices. This year was the first time that it was held outside Manila. Cebu prides itself with an established media organization that functions as a cooperative and provides legal and medical assistance. “Media competition in Cebu is both friendly and fierce. We may criticize each other but that is meant for us keep our news factual and straight,” shared one Cebu journalist. In February next year, MediaNation will tackle corruption. “Media has the loudest voice. We are glad that they are echoing our campaign for freedom and anti-corruption,” said Friedrich Naumann Foundation for Liberty (FNF) Country Director Jules Maaten, who was one of the sponsors of the event.